Hi friends! Hope you are having a great week! I'm happy that the weekend is almost here. I'm pretty sure that I say that every week but it's just the truth. I'm sure you all feel the same way. So, here's my card for this week. I started it when my head was feeling horrible so this was NOT the original plan for this card. It was going to be one layer but then my sentiment was crocked. GAH! So, I cut out the tree (from Unity's Could I Be Any Cuter?) and put it on this piece of October Afternoon Modern Homemake paper. The big pink gems are Doodlebug, the gold are Studio 18, and the teal are Kaisercraft. I finished with a sentiment from Unity's Bevy of Butterflies, Stickles, and some twine. Have a great day everyone and be sure to check the Unity Blog to see everyone on today's blog hop. Don't forget to leave comments, you never know where that blog candy will be hidden! What a fun bling tree. Adorable tree! I love all the bling and the way you used the twine wrapped at the bottom. SOOOO cute!!! Love the way you did the tree!!! Ashley, your card turned out lovely, even if this wasn't your original intention! Love the tree with all the gems! LOL I love all the bling in the tree! That is super cute!! Bling, bling, bling. Nice tree. Totally cute! I just love your blingy tree. The colors are wonderful! super cute bling'd out tree!!! 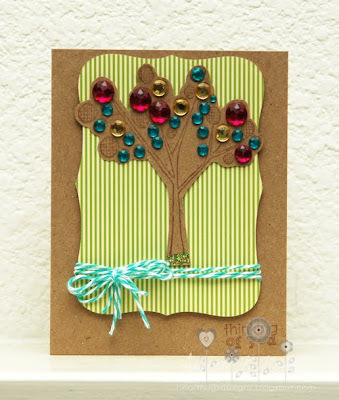 Love the gems on the tree and the twine...great job! Love the bling on the tree! Whitney is so awesome to work with! Can't wait to see what's ahead! !